PORTOVIEJO, ECUADOR – With its winding lagoons and beautifully landscaped grounds dotted by sports fields, playgrounds, monuments and plazas, the 15.28-hectare La Rotonda Park has become a focal point of community life throughout the province of Manabí. It also stands as a testament to the indomitable spirit of the people of the area, having been opened a little over a year after an April, 2017 earthquake devastated the area. At the heart of this important and symbolic landmark is La Rotonda Park Stadium, a popular multi-use facility that seats 5000. Recently, the mayor of Portoviejo, Agustin Casanova, led a campaign to illuminate the massive tensile membrane roof that covers the stadium. Accomplished with a collection of 24 ILUMINARC LED fixtures, the brilliant color wash that now adorns the stadium’s covering enhances the appearance of the entire park at night. Sonotec Ecuador and T&S Group illuminated the cone-shaped structure, which covers an area of 2134 square meters (22,970 square feet), and has a main mast that reaches 33 meters (108 feet) in height and a secondary mast 24 meters (79 feet) high, installed by Serge Ferrari of Industrias Kron. 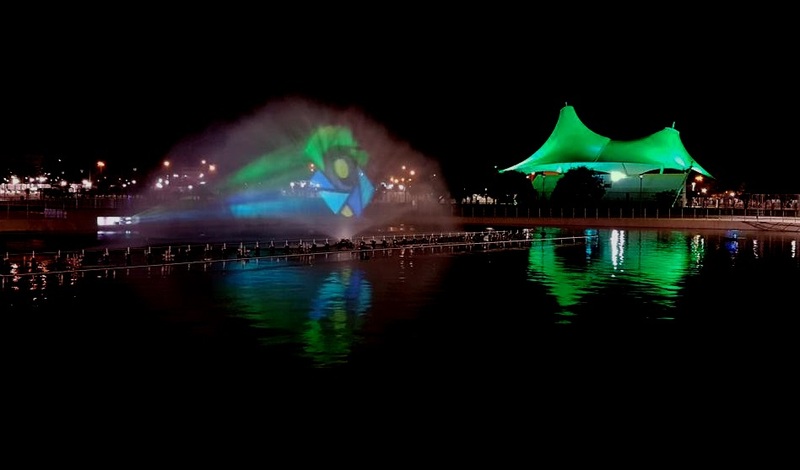 Bathed in a rich variety of colors by the ILUMINARC fixtures, from soft pastels to deeply saturated jewel tones, the La Rotonda Park Stadium roof glistens against the night sky, a symbol of Portoviejo’s vibrancy and determination. Sonotec used 10 COLORIST Panel 36Qa and eight COLORIST Panel 8Qa RGBA panel lights, all of which are positioned at the top ends of the tensile membrane posts. Also included in the lighting design are six Ilumipod Inground Tri-12 IP RGB circular LED wash fixtures, which are embedded at the base of the poles, and two Net-X nodes. With its intense output (5070 lux at 5 meters) and 16° beam angle, the COLORIST Panel 36Qa was chosen for the project because it can cover large areas of the massive tent surface. The COLORIST Panel 8Qa was used to fill in smaller spaces on the irregular tensile covering surface. To complement the lighting of the tensile membrane, the Ilumipod colorizes the structure’s supporting poles, which vary from 10 to 33 meters in height. A Dual Vector Array system was used to adjust the lighting created with the Ilumipod units according to the position and inclination of each pole. 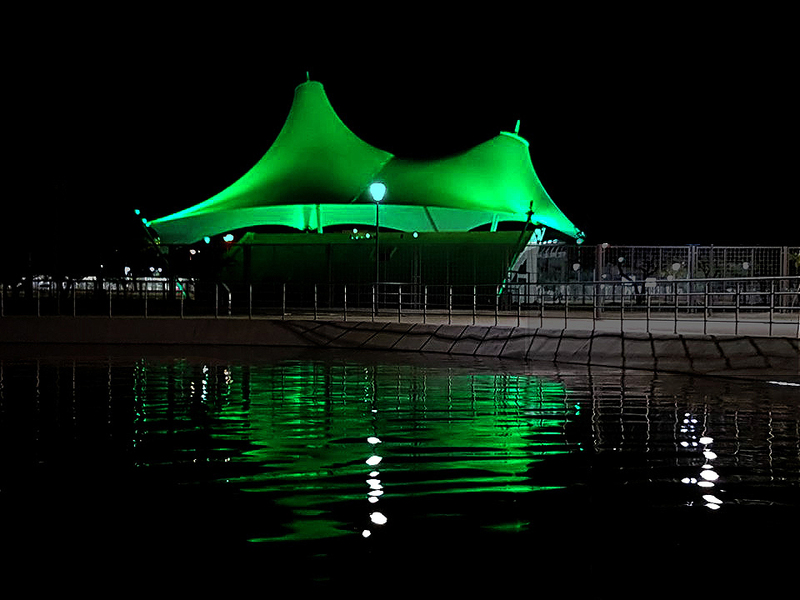 In addition to being specified for their color rendering capability, the ILUMINARC fixtures were selected because they can withstand the high temperature and humidity conditions that prevail around the park. Controlled via DMX, the fixtures are turned on automatically every night at 6:00 pm. The colors projected by the lights vary depending upon the time of day and year. Different colors will also be displayed to reflect the various festivals and special events that take place at the park, which has become a hub of activity for a city and region that knows how to enjoy life, and overcome adversity.